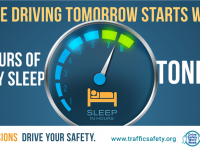 Today's NETS Drive Safely to Work Week tweet focuses again on the critical importance of sleep to driver safety. Feeling drowsy while driving? The only true countermeasure is to pull over and take a break. Safe driviung tomorrow starts with 7-8 hours of quality sleep tonight. YOUR DECISIONS DRVIER YOUR SAFETY.